Delivery charge is Rs 97/-₹. Free shipping above Rs 2999/-₹ (Standard Shipping) *As per Guidelines of Airport Authority of India Batteries can’t shipped in air courier. Shipping will be done through our shipping partner and courier will be assigned according to serviceability of shipping address and ordered product. Delivery time is usually 2 business day to Mumbai/Delhi/Pune/Goa locations after dispatch (Without battery products) and 3-4 business working days within South India and 4-6 working days to other areas in through standard air service but in exceptional case of it may take longer time because of offload/security issue at airport/flight delay or cancellation. Shipments Containing battery ships via ground Mode takes more time request you to cooperate with us as we also eager to deliver you the order soon as possible. For any query regarding shipment (After Dispatch) please contact Logistic Company Fedex-1800-419-4343,Bluedart-1860-233-1234 directly. Order placed before 3.30 pm will dispatch same day and after that will be dispatched within 24 hours means next working day. (except Sunday and Public Holidays). Please Note-Shipping address Can’t be changed after order dispatch. We will Share tracking details with Courier name once we dispatch your order on your registered email address.once you receive tracking details please make followups with relevant courier fedex on 1800-419-4343 ,Bluedart- or+91-1860-233-1234 or track online status on respective couriers website. 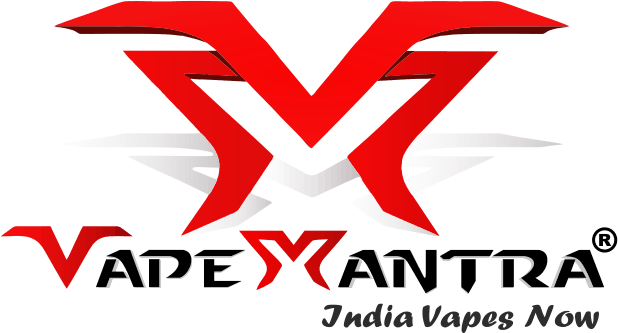 if your order does not reach you after 8 days please leave a mail on info@vapemantra.com with your order number in subject line. 4) In case of damaged product received. 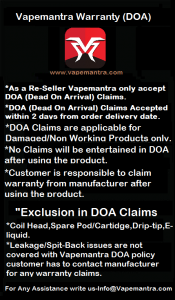 in case of Dead on Arrival (DOA)/Damaged product/Manufacturing defect found please inform us on info@vapemantra.com within 2 days of item receipt and return us the product within 7 days of delivery in unused condition with original packaging.after the given time frame we cannot provide the replacement.after the inspection process same product will be provided in the exchange of damaged product or can offer refund/another product if the particular product no available in stock. 5) Wrong product ordered by customer’s Fault. in Case any customer ordered wrong product by mistake or with some confusions we can exchange that (should be in unopened condition or resealable condition.in case unsealed package return or replacement restocking charges may be apply. In such wrong item ordered case customer is liable to send the product to our warehouse with own expense.shipping charges shall not be reimburse to customer .Note-Consumable Products like Coils,E-juices cannot be returned partially or in unsealed condition. Taste of E-Liquids are Subjective and choices vary person to person-we do not accept returns/replacement of e liquids in any case after unsealing bottle. 6) product does not match as described. in such case we gladly accept return and replacement of wrong product with return shipping charges reimbursement (Max 100/-Rs) or reverse pickup from our side (Subject to reverse pickup covered pin code )Note-Consumable Products like Coils,E-juices cannot be returned partially. * Please note-Reverse Pickup May take 2-4 days. Note- Customer have to borne State Entry Tax and Octroi (if applicable). In case of non delivery of package and after confirmation from courier about misplaced package or non-trackable situation replacement of the same product will be shipped with new awb number to customer or customer can request for refund as that is our responsibility to deliver the package. * Replacement/Refund is only possible after confirmation the same from Courier Company until customer has to wait for the same. Exclusion of service area-Sorry we could not ship the battery containing orders for Andaman and Nicobar islands.orders placed for this location will be cancelled and refunded. For More information on Frequently Asked Questions please check below link below.